Definition: Atherosclerosis, also known as an arteriosclerotic vascular disease, is a condition where the arteries become narrowed and hardened due to a buildup of plaque around the artery wall. Initially, there are generally no symptoms. When severe, it can result in coronary artery disease, stroke, peripheral artery disease, or kidney problems, depending on which arteries are affected. Symptoms, if they occur, generally do not begin until middle age. The following terms are similar, yet distinct, in both spelling and meaning, and can be easily confused: arteriosclerosis, arteriolosclerosis, and atherosclerosis. 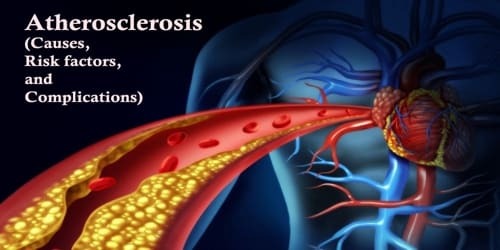 Arteriosclerosis is a general term describing any hardening (and loss of elasticity) of medium or large arteries (from Greek ἀρτηρία (artēria), meaning ‘artery’, and σκλήρωσις (sklerosis), meaning ‘hardening’); arteriolosclerosis is any hardening (and loss of elasticity) of arterioles (small arteries); atherosclerosis is a hardening of an artery specifically due to an atheromatous plaque. The term atherogenic is used for substances or processes that cause the formation of atheroma. Atherosclerosis is a specific type of arteriosclerosis, but the terms are sometimes used interchangeably. 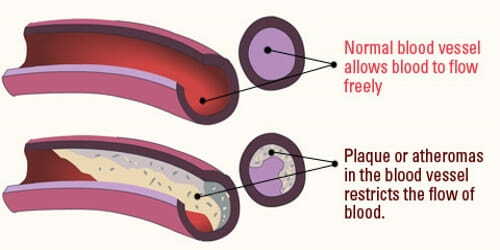 Atherosclerosis refers to the buildup of fats, cholesterol and other substances in and on our artery walls (plaque), which can restrict blood flow. The plaque can burst, triggering a blood clot. Although atherosclerosis is often considered a heart problem, it can affect arteries anywhere in our body. 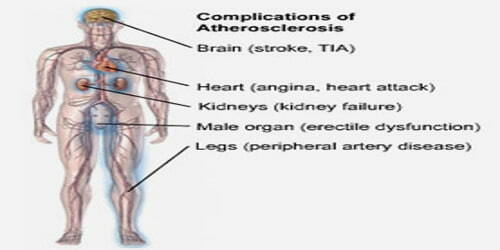 Atherosclerosis is a fairly common problem associated with aging. This condition can be prevented, and many successful treatment options exist. Avoid foods with added sugar, such as sugar-sweetened beverages, candy, and desserts. The American Heart Association recommends no more than 6 teaspoons or 100 calories of sugar a day for most women and no more than 9 teaspoons or 150 calories a day for most men. Avoid foods high in salt; aim to eat no more than 2,400 milligrams of sodium per day. All people with atherosclerosis have arteriosclerosis, but those with arteriosclerosis might not necessarily have atherosclerosis. However, the two terms are frequently used with the same meaning. Diabetics, despite not having a clinically detectable atherosclerotic disease, have more severe debility from atherosclerotic events over time than non-diabetics who have already had atherosclerotic events. Thus diabetes has been upgraded to be viewed as an advanced atherosclerotic disease equivalent.